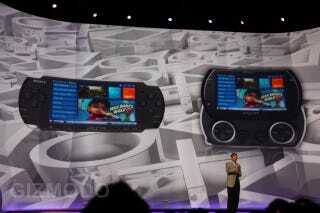 So what will happen to all of your old UMD games if you buy a PSP Go? You'll be able to procure digital copies of those discs, maybe even for free. We're in the midst of putting together a good will program. We'll be unveiling that soon [because] we actually think there's a significant group that will be upgrading from the 1000...In the past, we've seen a 20-25% trade-up factor, and I assume that's going to be the case here. We've modeled that. So we're looking at a good-will program—a short term good-will program that would continue for years afterward." Speaking more regarding the technical aspects of the good will program, Koller explained while the distribution model was still in the planning stages, the user's experience would be similar to Portable Copy—a way in which Blu-ray movies can be ripped and converted from the PS3 to the PSP. However, Koller assured me that users would not be ripping their UMDs. Instead, it sounds like Sony will use a PSN-based digital distribution model will "encourage" users to sign up for the service. But the neatest thing about Koller's Portable Copy comparison? Portable Copy is free. So we're doubting that Sony will charge for the service—though we have no confirmation. Unfortunately, Koller also slipped in that Sony's "looking at what kind of games will be offered." In other words, Sony's good-will program will probably not apply to every title in the PSP's library, but given that there are only a few that matter anyway, maybe this limitation isn't such a big deal.